The next time someone tells you what great pasta some Eye-talian restaurant has, we suggest you dial up this website, show them these pictures, and then ask if what they’re raving about is even in the same league as the noodles put forth every night by B & B Ristorante. With only a few exceptions: Valentino, Fiamma, NOVE, Sirio…they won’t be. Our recent meal there (courtesy of our favorite ‘cuz and frequent commenter Troy Polee – not his real name), was fork-dropping-ly stunning, and we ran out of adjectives praising the ways Molto Mario and his crew have with lune, spaghetti, ravioli, and tagliatelle. What strikes about these creations is their perfect balance. Always fresh, al dente pasta, then a main ingredient (animal or vegetable), accented by one or two seasonings. Simple, elegant, and packed with flavor. Nothing is overdone or overwrought, and the whole always exceeds the sum of its parts. They’re also beautiful to behold and make great tasty snaps. The only sour note of the evening was the otherwise excellent steak “Tagliata.” Putting aside for a moment why ELV would order a steak in a pasta restaurant (especially with CUT and Carnevino just down the hall), the cutlery provided with this piece of beef was over-matched in the extreme, and clearly not up to the task at hand. We were (literally) unable to cut our steak with the kitchen knife provided….and Executive Chef Zach Allen had to sheepishly admit they had nothing sharper in their drawer. So we returned to the black spaghetti with ‘Nduja (spicy Calabrian sausage) and Sicilian pesto, and the beautiful, house-made cotechino sausage with lentils, and all was forgiven. A fitting tribute. If we had to list the 10 best pasta’s that we ate in 2009 it would not be a stretch for at least 7-8 to have come from B&B, most of them fresh seasonal creations that are only on the menu for a short while. Two are in the photos above – the one with no name is their “Cappellacci with pigeon”, a wonderful winter dish, as is the “Tagliatelle with guanciale and parsnips”. The simplicity of the latter is so deceptive. The sad news is that they will not be on the menu too much longer; the good news is that spring is just around the corner. 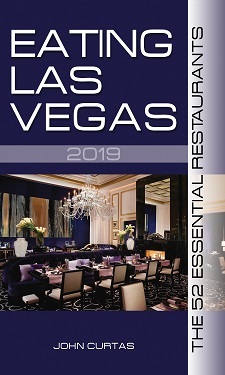 Let’s give B&B a sincere pat on the back for turning their menu over often, something that is rare on the Strip, and for refusing to play it safe. Bon Appetito Cuz! lets mangiare again soon! Not only is the food always good at B&B and Carnevino, but they brought in a wonderful farmer’s market on Thursdays that we locals can get some otherwise unattainable produce and etc. outside of California and Arizona. Really great stuff at B&B – never had a bad anything here. I also agree that Chef Luciano’s pasta at Valentino is up there with anyone’s. Nove, though, a different story. The food there has always been pretty good – but the pasta dishes we’ve had have been clunky and heavy-handed. I’ve only eaten Fiamma’s food once but everyhing we had was done very well. Yep, we have Molto Mario to thank for the fabulous farmers’ market and I’ll have to kick my @ss over there soon to grab some good groceries to try making some of these good dishes at home. I particularly like Sinatra at Encore. The food is simply fabulous, and it’s true Italian (even if the vibe is more “Classed Up Rat Pack Old Vegas Italian-American”). Ago at Hard Rock is also simply divine. Another true Italian joint that I love to pieces is Marinelli’s at The M (IMHO they’re one of the few Henderson casino restaurants serving Strip-quality food, much like most of the other M creations). I just have to make it to B&B soon to see how the pasta there stacks up to my three current Italian faves. atdleft- If B & B doesn’t blow those three out of the water in your eyes then I’ll eat my hat. B & B is superior to Sinatra in every way. Marinelli’s is good, but not in the same league. I haven’t been to Ago, but I will have to try it soon. I went to Sinatra when it first opened and it was truly excellent. I had the pappardelle bolognese and you could see a glistening layer on the sauce and know it was made with lots of bones and cartilage ! Incredible depth and complexity of flavor. Truly sublime. I Returned a couple months later and the food was good. Went back a couple months later again and the food was just ok. Went back a fourth time and the food was borderline olive garden quality and never returned after that. That was a year ago and maybe things have changed. They really had a great thing going but I think the bean-counters may have gotten involved and ham-stringed them. Ago at the Hard Rock is not even a shadow of the one in L.A.
My personal favorite in town for pasta is Chef Luciano at Valentino. IMHO Nobody is better with pasta as well as birds than him. Make sure he’s there though, if you go, as he is quite busy lately I’m told. In fact, I have to get back in there soon ! Really? If Sinatra is going downhill, then that will be a real shame to Wynncore. I guess I’ll have to check in when I’m back in town and see if they’re losing it. I haven’t yet been in the Ago in LA, but I can say my last meal at the one here in Vegas was quite superb. The chefs know what they’re doing IMHO and service is great. Now I have been to the Valentino in Santa Monica, and everything there was stunning beyond belief! I’ll have to make it to the Venelazzo one here soon to see if they’re paying as much attention to the Vegas locale. OK, it’s on! I’ll let y’all know when I snag a reservation at B&B. We were at B & B last night, and oh what a night! Service was excellent and the dishes just kept rolling out, each a unique and deliciously complex delight. The only quibble would be that the Calabrese salad was much special, to say the tomatoes were flavorful is hardly a recommendation at this time of year. But the grilled octopus is simply genius and we wonder how they manage to come up with the tender succulence they consistently achieve. The Limoncello sauce underneath the chunks of grilled fish is an inspired accompaniment. Our pastas were two: one the ‘pyramids’ and the other gnocchi with oxtails. Although both were meat based they individuated perfectly: exquisite pyramids with a burst of brilliantly seasoned meat in a light tomato based sauce and the oxtail perfectly paired with the lightest imaginable gnocchi. For a meat course, the lamb chops are grilled (‘smoky fingers’ meaning your fingers get smudged from the charred bones as you try to get every last morsel) having been dredged in a salty preparation that encases the tender and refined lamb flavor, nothing gamy about this meat. Underneath, an unsweetened lemon yogurt prepared with toasted ground cumin was a worthy accent and a sauce or dressing we could imagine using in many other dishes. We only had one dessert, the grilled pears with lightly sweetened lemon ricotta, again a wonderful combination. The shortbread cookies that were layered with the pears in a tower were unnecessary and didn’t hold up that well to the creamy ricotta. I’d go back in a second, to enjoy the well-informed and friendly attentions of our waiter Chris and besides, the rest of the pastas are waiting for me. Babbo West is what my wife and I refer to B & B. All the greatest hits, like beef cheek ravioli and oxtail gnoocchi, excellent grilled octopus and the greatest rib eye I have ever had, period. And to add to Mr. Curtas’ list the original Craft and Three Forks have nothing on B & B.